A statement of support for religious freedom by President Barack Obama fueled an ideologically driven debate in the media over a proposed Islamic center in New York last week. A milestone in the Iraq war, continued economic travails and a mostly hung jury in a corruption case involving a colorful former governor also vied for attention. The debate over the proposed Islamic center a few blocks from where the World Trade Center once stood was the biggest story for the week of August 16-22, accounting for 15% of the newshole studied by the Pew Research Center’s Project for Excellence in Journalism. That was a sharp increase for a story that has simmered mainly on the blogosphere. Much of the boost could be attributed to a comment at a White House dinner by the President. The withdrawal of the last combat brigade from Iraq made the war the No. 2 story last week, with 9% of the newshole, according to the PEJ News Coverage Index, which tracks coverage across media sectors each week. The economy – which has dominated news coverage since it plunged in late 2008 – generated headlines again last week when a report showed a spike in people seeking unemployment insurance, raising more doubts about the durability of the recovery. This followed reports of continuing weakness in the housing sector. Taken together, the economy overall was the third- biggest story of the week, with 7% of the newshole. The split decision in the case of impeached Illinois governor Rod Blagojevich was the No. 4 story, filling 6% of the newshole studied. After listening to weeks of testimony, federal jurors convicted Blagojevich of a single count of lying to federal agents while declaring themselves unable to agree on 23 other counts. Blagojevich, whose time out of office and pending trial has i ncluded a stint on a reality TV series, declared victory and promised to appeal the one conviction. Prosecutors said they will try him again on the charges that stymied the jury. Heading into the traditional Labor Day commencement of the campaign season, meanwhile, the 2010 midterm elections was the 5th most covered subject of the week, filling 5% of the newshole studied. That was down from 15% the week before, but represents a sizeable showing and reflects strong media interest in elections this fall that could alter the balance of power in Washington. 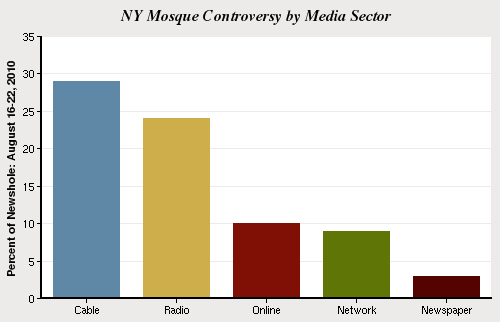 Controversy over an Islamic center that would include a mosque planned for a site a few blocks from ground zero in New York provided a case study in the divergent agendas of different sectors of the media culture. The proposal elicited strong reactions from people across the political spectrum and dominated the ideologically driven talk shows on both cable TV and radio – but registered barely a blip in mainstream newspapers. Nearly a third of the airtime studied on cable TV (29%) and one-quarter of that on radio (24%) was devoted to the topic. When straight-news programming from those sectors is removed, an analysis of cable and radio talk shows in the PEJ sample showed an even bigger fascination with the controversy: 45% of airtime, making it by far the biggest topic on those programs. Online news outlets, meanwhile, devoted 10% of their newshole to the mosque controversy. Network TV, by contrast, devoted more time to Blagojevich’s legal troubles (11% of the airtime studied) and Pakistani flooding (also 11%), pushing the mosque story into third place for the week (9%). Newspapers devoted 3% of their newshole to the subject. Though the Islamic center proposal has been around for a long time, much of the previous coverage was limited to politically oriented blogs and local news coverage. That changed when President Obama spoke out in favor of the project at a White House dinner to celebrate Ramadan, the Islamic holy month. The story was then further fueled when he tried to dial back those remarks, saying he believed the developers had the right to build the center but wasn’t saying they should. For the week, Obama was the lead newsmaker in one-quarter of the mosque stories in the PEJ sample, demonstrating the role his comments played in elevating the story. In short, though the story was probably a political distraction for the president, the numbers suggest it was one of his own making. For the ideologically driven talk shows, the coverage was intense regardless of political orientation, a fact that demonstrates the symbiosis of opinion hosts who often report on identical stories from opposing viewpoints. Conservatives decried the proposal as an affront to the victims of the terror attacks. Liberal hosts portrayed the reaction as xenophobic and contrary to American ideals of religious freedom. Sean Hannity, a conservative host of a Fox program, for instance, devoted most of his program August 16th to the topic, which he referred to as the “August surprise.” He played a clip of the president addressing a Ramadan gathering of Muslims at the White House the Friday before saying he supported the right of the developers to build the center. Hannity also showed a clip of the president the next day backtracking, saying he wasn’t endorsing “the wisdom” of the project. Hannity quickly saw the issue in a political context. “By commenting on this controversial topic, President Obama has, perhaps unintentionally, made this a pivotal mid-term issue and vulnerable Democrats up for re-election this November are doing their best to distance themselves from the White House,” Hannity said. He played a tape of a leader of Hamas, a political movement that the U.S. classifies as a terrorist organization, also supporting the mosque project. With an on-screen label reading “Ground Zero mosque,” Hannity then interviewed several opponents of the plan, including former GOP presidential candidate John McCain, and Debra Burlingame, the sister of the pilot of the plane that was crashed into the Pentagon on Sept. 11. “It felt like a kick to the stomach,” Burlingame said of the proposal. That same night across the television dial and the political divide, MSNBC liberal host Keith Olbermann was focused on the same topic. But he called the reaction to the mosque “fake hysteria with the real danger of intolerance.” He noted that the plans call for a YMCA-like center with a swimming pool and that the building is blocks away from ground zero. Like Hannity, Olbermann played clips of political leaders coming out against the center, but provided his own disparaging commentary on each. “The president’s shrillest political opponents, having gotten it wrong on principal and fact, now say he is ‘out of touch’,” Olbermann said. He played a longer clip of Obama’s White House comments from the Ramadan dinner, ones that included the president’s acknowledgement of the emotions the project engendered among survivors of Sept. 11 victims along with his defense of the project on the grounds of religious freedom. Olbermann then interviewed Rudi Odeh-Ramadan, a Muslim-American who is head of Columbia University’s Clinical Trials Office and who had been a first-responder on the scene of the terror attacks on the World Trade Center. “To say you don’t have the same rights as all Americans…is to place collective guilt on all Muslims,” Oden-Ramadan said. The withdrawal of the last U.S. combat brigade from Iraq last week provided an opportunity for many in the media to take stock of how the war there is progressing and whether or not a “victory” can ever be declared. The Iraq war accounted for 9% of the newshole and was among the top five stories for every media sector. This was something of a reversal for a seven-year-old war that has been largely eclipsed by events in Afghanistan over the past year. Iraq has not been among the top five stories in PEJ’s News Coverage Index since June 29-July 5, 2009, some 14 months. So far this year, the conflict in Iraq has accounted for 1% of the newshole studied. Afghanistan by contrast has attracted 4%. Nearly all the Iraq stories last week concerned the withdrawal of troops and the role of those soldiers who remain. While much of the coverage featured celebrations by service members and their family, the ambiguity of the phased pull-out left plenty of room for analysis and debate about whether the war was really over and whether it had been worthwhile. The combat mission formally ends Aug. 31 but 50,000 troops will remain in the country for another 16 months to assist local forces. “The symbolism of the departing troops that played out on network television masked the more complex reality on the ground…Iraq’s future remains fraught with challenges amid a stubborn political impasse and a continuing low-grade insurgency,” reported a New York Times news analysis. NBC correspondent Richard Engel was embedded in the last brigade to pull out, and the network was permitted to include a satellite truck in the convoy so that it could broadcast live video – access that raised complaints from competitors that the Pentagon was favoring NBC and by implication its left-leaning affiliated cable channel, MSNBC. A Pentagon spokesman, in comments to Yahoo news, denied any favoritism, noting that other media outlets were embedded with the unit but NBC had been the only one to request permission to bring a satellite truck. A continuing flow of data that suggested the recovery was now sputtering pushed the economy back into the headlines last week. With 7% of the overall newshole, the economy led in only one sector, newspapers, but was among the top five stories for online news, network television and radio (it was the No. 6 story for cable news). Chief among the storylines were stubborn troubles in the housing market as well as a weekly report that showed an unexpected jump in filings for unemployment benefits. The No. 4 story of the week (6%), the ambiguous verdict in the corruption trial of impeached Illinois governor Rod Blagojevich, was especially prominent on network news broadcasts. Indeed, Blagojevich proved the biggest story on those broadcasts last week, accounting for 11% of the airtime studied by PEJ. It was also among the top five stories for cable (No. 3), and online news (No. 5). Prosecutors accused Blagojevich, among other things, of trying to “sell” the Senate seat vacated by President Barack Obama. The case included secretly recorded audio tapes of the governor’s conversations with aides, in which he used profanities to brag about the value of his right to appoint a successor to the seat. Adding to the fascination with Blagojevich perhaps was a stint he did on Celebrity Apprentice while awaiting trial. The coming midterm elections, a topic gaining coverage in recent weeks, fell back to the No. 5 spot last week at 5% of the newshole. The week before, in the wake of some key primary races, election coverage had been No. 1, with 15% of the newshole. A number of factors drove the coverage last week, including a campaign swing by the president on behalf of some candidates and the release of polling that showed his approval ratings in decline. The political implications of his statements on the proposed Islamic center near ground zero also drew coverage, as did indications that the once-embattled Sen. Harry Reid is improving his odds against a tea party-backed challenger. A pair of polls – one by the Pew Research Center and another by Time Magazine – received significant attention last week when they revealed that large numbers of Americans mistakenly think Obama is a Muslim. Obama and his administration were the No. 6 story of the week, with 5% of the newshole. Questions about his religion accounted for 80% of that coverage. The colorful former governor of Illinois was a major newsmaker for the week, coming in second only to President Obama. Blagojevich was a lead newsmaker in 5% of the stories sampled (To be a lead newsmaker, someone must be featured in at least 50% of a story). The President was a lead newsmaker in 10% of the stories. A pair of latter-day Bonnie and Clydes were the next biggest newsmakers: John McCluskey, who escaped from an Arizona prison on July 30, was arrested last week in Arizona with Casslyn Welch, his fiancée and first cousin. Police allege that Welch helped McCluskey and other inmates break out of prison. McCluskey, the No. 3 newsmaker, and Welch, No. 4, were both leading newsmakers in about 1% of the stories sampled. Retired baseball pitcher Roger Clemens was the No. 5 newsmaker (1%). He was charged last week with lying to Congress about using performance-enhancing drugs.